In ‘Presenting with iPad (1)’ I talked about the possibilities to present any kind of information for an audience using additional hardware. This article is about an app called ‘Electric Slide’ working with minimal hardware requirements: a screen and a browser. Electric Slide is a product of elucidate llc. We’re a DUMBO (Brooklyn, NY) based business that designs and develops mobile applications for business productivity and healthcare. Elucidate was founded by Angelo Alduino and Jim Phelan in April of 2012. Angelo and Jim are veterans of the web based collaboration field. Electric Slide was borne out of the idea that presenting is an inherently mobile activity trapped in a PC based presenting model, largely due to a lack of appropriate tools. The app Electric Slide is designed to provide simple wireless presenting by giving each user a unique URL. Upon entering a meeting, a user can simply type their URL into a web browser and begin presenting wirelessly with their device. After uploading the content to a webserver of the company it’s delivered back to the audience controlled by e.g. an iPad, an iPhone or any other mobile device with the app installed on it. If an internet connection is not available the presentation device can connect directly to a TV using an HDMI/VGA adapter or Apple’s AirPlay. The app also allows multiple devices to pair via Bluetooth. Electric Slide uses the company’s proprietary technology to convert all content to HTML5. Animations and effects are preserved so that PowerPoint presentations and other documents can be viewed without loss of formatting. Right now, Apple’s Keynote presentation files are not supported – though support for them is planned for a future update. This should be added as Keynote is by far the best presentation app right now for the iPad. 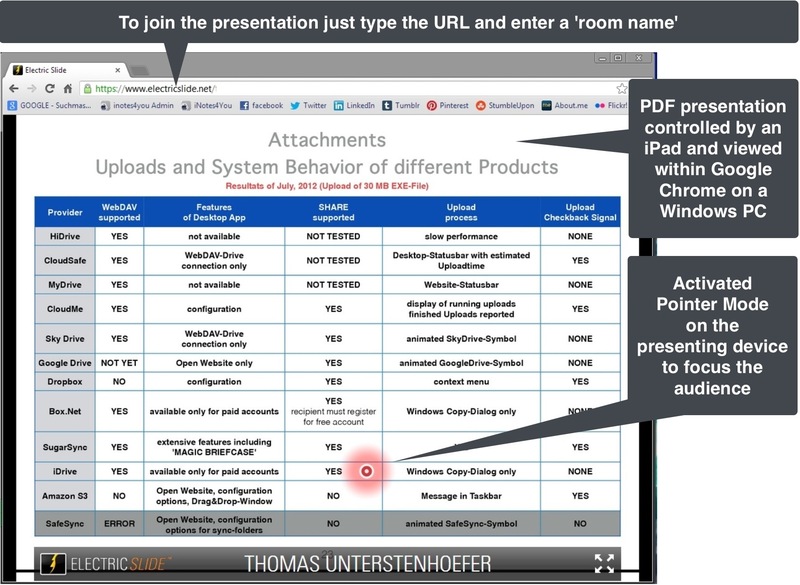 Keynote presentations have to be uploaded as PDFs. Internet Explorer 10 is not supported. The viewers have to use Google Chrome, Firefox, or Safari. All viewers must share the same room. Create a ‘Room Name’ that will form part of your custom URL used when you present. Once the file uploads to the Electric Slide’s webserver and gets processed you can broadcast it to your custom URL right away. 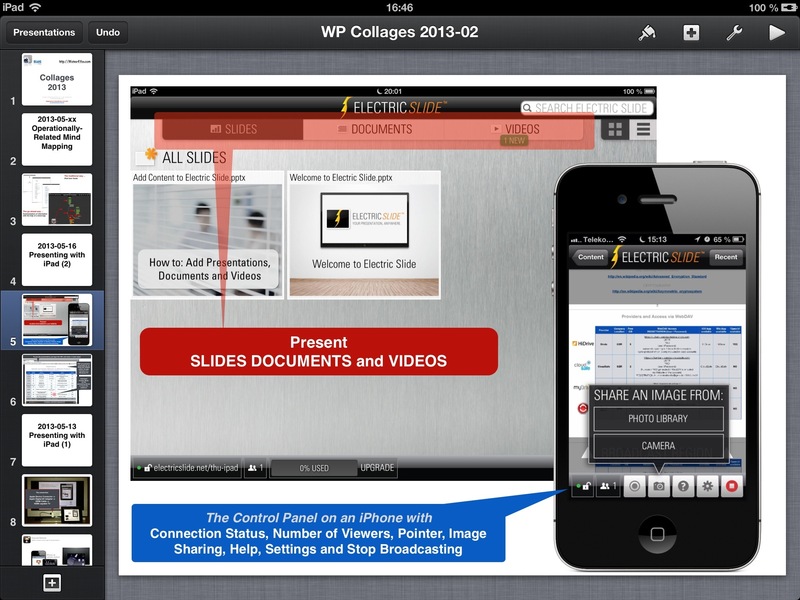 Look at this image to see the options for controlling the presentation. An impressive idea where, I hope, some features will be added in the near future to bridge the gaps.